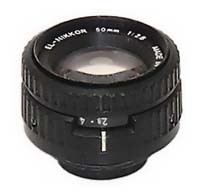 EL-Nikkor 50mm enlarging lens, the normal focal length for 35mm negatives, with later style barrel, f2.8 maximum aperture, and illuminated aperture scale. Made in Japan by Nikon. Note: These lenses are not supplied with a retaining ring. If a 39mm retaining ring is required for your application, it may be purchased as an accessory - please see the separate listings under "Rings and Adapters".